Meandering Red River to get fixed with a route canal. 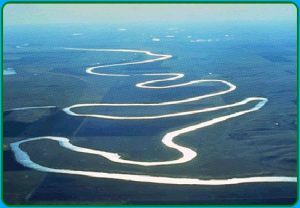 Fargo, ND – In an effort to increase the efficiency of the Mighty Red River of the North, the Army Corps of Engineers is going to straighten out the river’s seemingly random and needlessly meandering route. “By making an almost perfectly straight canal, the river’s route will have much improved flowability,” explains Loran Toca, who is heading up the massive shovel-ready project. The resulting “route canal” will not only relieve natural “pain” caused by decaying tree roots around each unnecessary curve, but will also help the Amry Corps of Engineers win its War on Meanderings. Instead of having an inefficient river system with a bunch of superfluous turns and sections (not dissimilar to a governmental bureaucracy), the straightened “route canal” will significantly shorten the waterway for whenever it may be used for transportational purposes.